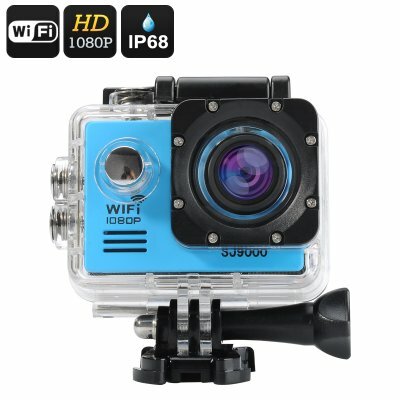 Successfully Added SJ9000 Wi-Fi HD Action Camera - 14MP, 2 Inch LCD Display, 170 Degree Angle, HDMI Out (Blue) to your Shopping Cart. There is a big world out there to see – and it does matter what quality you see it in. The SJCAM SJ9000 is a waterproof 1080P Wi-Fi sports camera that will let you easily capture great moments in great quality and share them with the world. The SJCAM SJ9000 is a sports camera that can follow you anywhere you go and capture HD footage at 30 frames per second. With a 170 degree wide angle lens, you will be able to capture lots of detail in every shot, as a well snap quick high quality images at 14MP. There are lots of ways to share the images and videos once you capture them. First, you can easily review all the footage you’ve taken on a 2 inch TFT screen – a great way to quickly check if all the images and videos came out looking the way you wanted them to. Thanks to Wi-Fi support, you can also share everything instantly on social media or via email. If you prefer to view your adventures on a large scree – that can be done easily as well thanks to the cam’s HDMI out. The camera comes with a 50 meter waterproof case, letting you indulge in all the water sports you want, from surfing to diving. Coming with a nice set of buckles, mounts and adaptors, the SJCAM SJ9000 can be mounted onto mist surfaces and ensure great angles for your action shots.